H&M – Hennes & Mauritz – as you probably know, is a huge high street clothing chain—over 2000 branches in 35 countries. The official app sets out to provide users with updates about sales and special offers as well as to simply allow them to view current collections, etc. Let’s find out if the app delivers! Some of you have been waiting with bated breath whilst others might be shaking their heads (or fists), wondering why an H&M app is even being reviewed… What can I say—I came across the app in the Market and thought I’d give it a go. And I have to say that I’m quite glad that I did! Designers and retailer websites are often based on Flash, and while Flash will run as of Android 2.2 FroYo the app versions usually turn out to be tiny, crippled offspring of their big brother websites. This doesn’t apply to the H&M app. The app was quite obviously conceived to provide that extra little bit more. First off, pick your country so that you will be shown the items available to you. The main menu is subdivided into categories that can be scrolled through horizontally. I’m in at the AndroidPIT headquarters in Berlin at the moment and beachwear is all the rage in Germany, like everywhere else. There are also categories for women’s and men’s collections, the ‘H&M Fashion Video’ and ‘Shop Online’. The latter links you to the H&M official website; too bad that shopping directly via the app isn’t possible. But the app does boast a lot of functions, so we’re willing to forgive this small drawback. When you click on the beachwear section you will see lots of small images of all of the items on offer. Clicking on one of these will enlarge the image and display the price of the item. To enlarge an image use the multitouch gesture and the +/- symbols. All of the images can be scrolled through in the full picture mode, meaning you needn’t return to the overview. •	Share: via Facebook, Twitter, Gmail etc. Access the wish list as well as lots of other functions by hitting the H&M button on the top left. The 'Find a store' function is especially useful: the app displays stores in your vicinity as a list or a map showing you where the stores are located. By clicking on a store details about its opening hours, which lines and collections it carries as well as the phone number for that specific branch. One click starts up Google Maps and navigation. 'News' displays the latest deals and offers, updates and current collections. 'My H&M' is probably the best feature this application has to offer: articles can be saved to the wish list (which can be edited and shared). Give your phone and H&M will reward you with the latest promotions. I got '50% off selected blouses'—jackpot! Gift cards can also be saved to the app (include the number and PIN), meaning you don't have to bring the card with you when you go shopping. Login to Twitter or Facebook under 'My settings' where you can also switch countries and deactivate H&M updates (they pop up sporadically in the status bar). 'H&M Fashion Video' shows promotional clips and fashion coaching; videos can be viewed in the browser or with the YouTube app. While online shopping directly via the app isn’t possible, the H&M app does provide pretty much everything else one could ask for. New collections, great deals, shopping lists, store locators and a few other functions really make this app a useful thing to have on one’s phone. Both the design and controls of the H&M app are very well done. It comes in a sleek red white and grey look and the controls are a dream: a well thought-out gallery with multitouch, a convenient store locator and the wish list—everything’s right there at your fingertips! 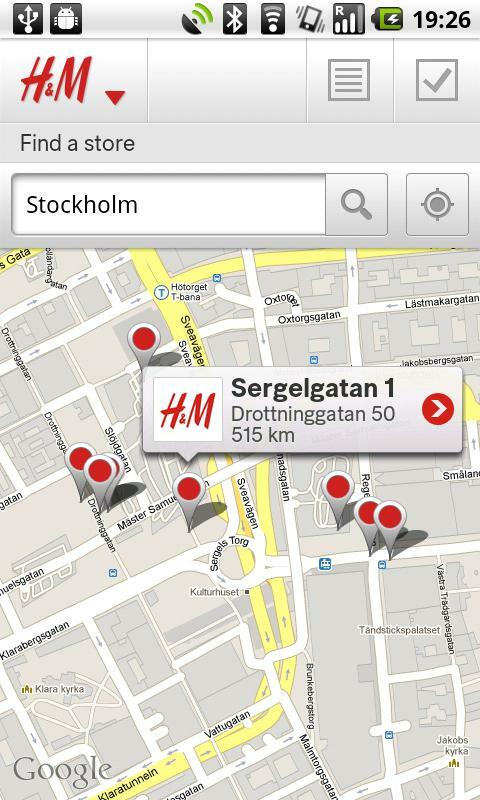 There’s no denying that H&M thought this thing through and the outcome is a very good app. The H&M app crashed once while we were testing it but aside from this there were no other glitches. Controls run smoothly and there was no lagging on either device on which we tested the app. The H&M app is available for free, and while its main function is obviously to generate profit for a big corporation there’s no denying that the app’s design and functionality are top notch, so we’re not knocking off any points.